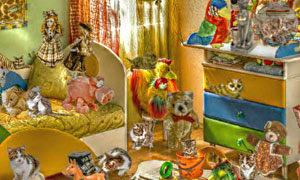 Cat Photographer is a another online hidden object game. Demonstrate your skills and attentiveness in the role of cat photographer. This profession seems easy outwardly, but actually every cat breed requires its own approach, its own breed vision. You should work quickly and qualitatively. The cats at the photo sessions are as the children; they get tired with monotonous actions easily and refused to work. First you should photo all cats that were chosen by the customer in this game. Then you should find all the cats in the children room and photo them. And at last find the differences between two similar photos. Good luck and have fun.